Overview : Now’s your chance to talk, strategise and control. Stay one step ahead of the opposition in online games with Bluetooth Wireless Headset for PS3, a great mic and earpiece unit that also works with Bluetooth-enabled mobile phones. At last, you can chat to your pals in online games without any cables to get in the way! It’s the ideal accessory for PlayStation 3 gamers who like to play online with gamers from all over the world. With your Bluetooth-enabled games console, you can trash-talk with your opponents, make new friends in the games lobby and organise your party in co-operative games. It’s great for making hands-free calls with your Bluetooth mobile too! 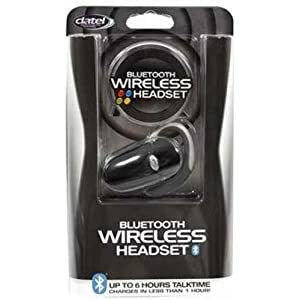 Bluetooth Wireless Headset uses the Bluetooth 2.0 protocol for fast, reliable data transfer. It boasts a comfortable, over-the-ear design, crystal-clear sound and it charges in under an hour. A single charge is good for six hours talktime or 250 hours on standby. Up to six hours talktime. Up to 250 hours standby. For gamers and phone users alike. Quality/Usability : Datel released two versions of their Communicator headset for the PS3. One is the bluetooth version which you are reading the review on and the wired version which we also reviewed. The Datel PS3 Bluetooth Wireless Headset is fairly about the same size of your average cellphone bluetooth headset. However, it is thicker. The bluetooth headset fits over your ear. It can go over either your left or right ear simply by turning the ear loop. On the headset itself, you have the ANSWER/END button on the face of the headset as well as a volume UP/DOWN buttons. The back of the headset has the jack to insert the USB charge cable. To charge the Datel PS3 Bluetooth Wireless Headset, simply connect the USB charge cable (included) into a USB port whether it be your PS3 console or PC and plug the other end of the USB charge into the headset. It took approximately 1 hour to fully charge the headset. Depending on the usage amount, you can get about 5-6 hours of use out of the headset. This is better than some of the bluetooth headsets on the market for cellphones in terms of talk-time. To use the bluetooth headset with your PS3 console, you'll have to register it with your console and then select it as an Audio Device. On your PS3's browser menu, go to 'Settings' then 'Accessory Settings' and finally 'Register Bluetooth Device'. Select 'Register Headset/Microphone/Headphones'. If prompted you will need to choose 'Yes' to registering a new Bluetooth device. To put your headset in registration mode press and hold the multifunction button on the front of the device for around 10 seconds until 2 blue lights illuminate continuously. Press 'X' on your controller to start scanning. Your PS3 should find a device called 'PS3 MAX'. Click 'X' again to select this device. When prompted for a Pass Key, enter "0000" and choose 'OK'. On your PS3's browser menu go to 'Settings' then 'Accessory Settings'. Under 'Input Device' select the device 'PS3 MAX' as Input and Output Device and choose OK. You should see the microphone level displayed on screen confirming the headset is working correctly. Once the bluetooth is registered and connected to your PS3, it is ready to be used. Using the bluetooth wireless headset, it was fairly good for the most part. There were times where the headset disconnected and I heard static. Regarding the headset disconnecting, I dont know if it was because it was low on battery or because I walked away from the PS3 (probably the latter). You can also use the Datel PS3 Bluetooth Wireless Headset as a bluetooth headset for your cellphone as well. Connecting the headset to your cellphone is the same procedure as if you would with any other bluetooth headset. According to the package, it also supports multiple call management, call waiting, voice dialing and last number re-dial when used with Bluetooth enabled mobile phone. Regarding comfortability, I was disappointed. The earpiece on the headset did not line up with my ear. When the headset was placed, it felt like it was falling off. Depending on how noisy your surrounding environment may be, you may need to push the headset closer to your ear. Conclusion : Overall, the Datel PS3 Bluetooth Wireless Headset worked great, battery and charging times were better than most cellphone bluetooth headsets but the comfortability and layout of the headset was a big turn off. It didnt fit properly into the ear and felt loose. Guests online: 452. Total online: 452.